When Rajiv Gandhi‘s “feeder airline” Vayudoot took flight in the mid-1980s, the onus of inaugurating its services to (and from) Mysore fell on the fragile shoulders of its most famous name, R.K. Narayan. The inaugural flight took off till it was noticed that the chief guest had been left behind. The plane came back to the old Mandakalli air strip to pick Narayan up. Interesting story, of course, if true. 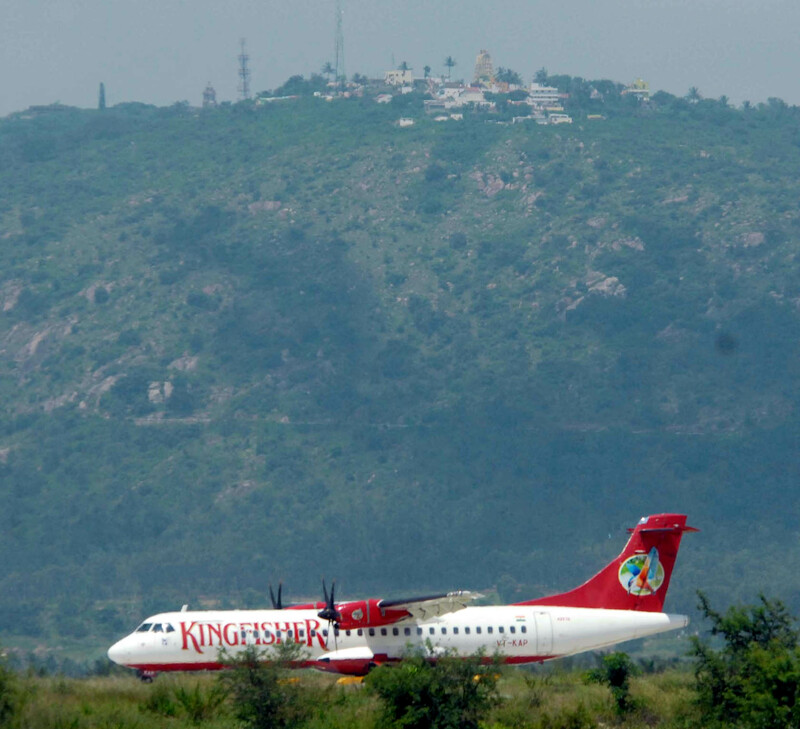 There were no such “mishaps”—real or made up—when a Kingfisher Airlines ATR -72 landed at the new, revamped airport (MYQ, in the air traffic controller’s lexicon) against the backdrop of Chamundi Hills to mark the commencement of commercial air operations to and from Mysore on Friday. 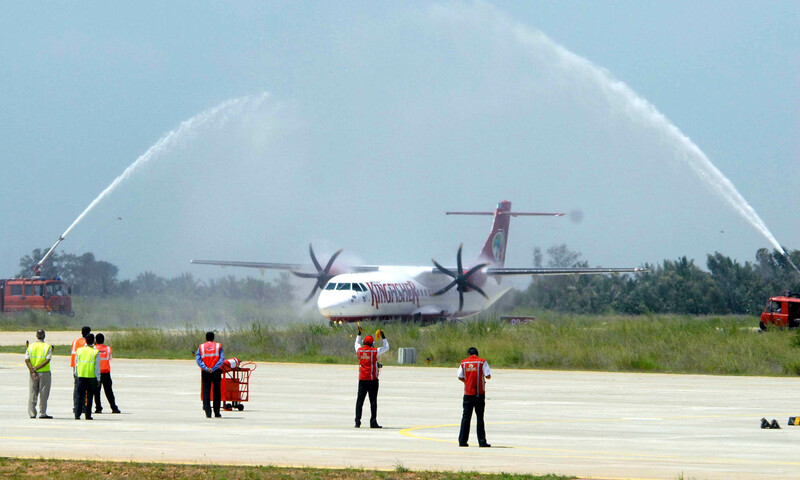 The plane was given a ceremonial aviation welcome—a “water salute” by fire tenders—before the decidedly less-literary VIPs of 2010—chief minister B.S. Yediyurappa, leader of the opposition Siddaramaiah, tourism minister Janardhana Reddy et al—alighted. 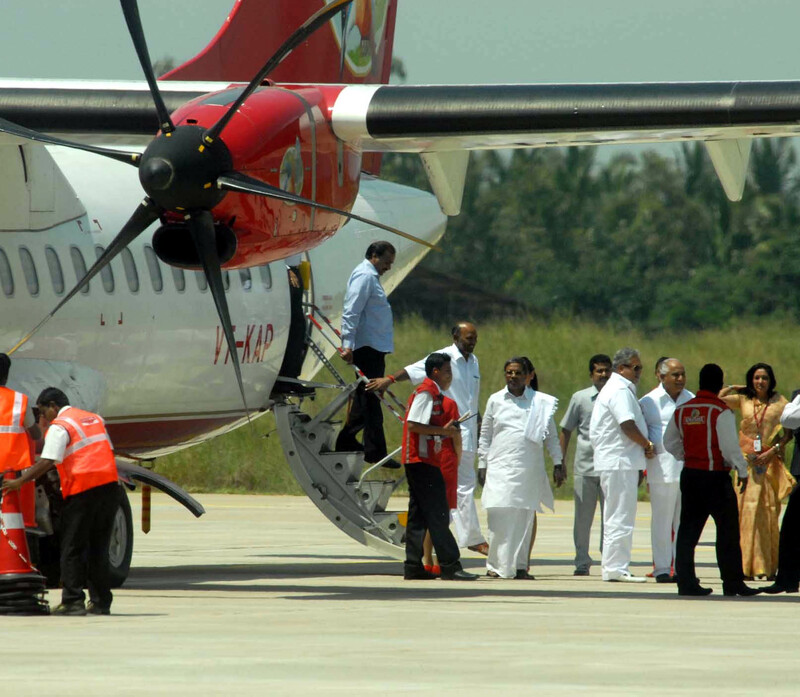 Kingfisher Airlines’ flight IT 2404 will depart every day from Bangalore at noon and arrive at Mysore at 12.45 pm. From Mysore, flight IT 2407 will depart at 2.20 pm and arrive at 3.10 pm in Bangalore. The new direct flight will offer travellers from Mysore a one-stop connection to and from Goa, Hyderabad, Mangalore, Poona, New Delhi, Hyderabad, Trivandrum, Cochin and Bombay via Bangalore. Also read: Is the Mysore airport jinxed before take off? This entry was posted in Issues and Ideas, Kannada & Karnataka, Mysore-Bangalore, R.K. Narayan Campaign and tagged Churumuri, IT 2404, IT 2407, Karnataka Photo News, Kingfisher Airlines, KPN, Mandakalli Airport, MYQ, R.K. Narayan, Sans Serif, Vijay Mallya. Bookmark the permalink. ← High Court verdict or Panchayat pronouncement? Can’t we have at least one post about Maisuru occasionally without an obligatory euology of the biggest, greatest, most celebrated name from Maisuru, Mahamanava R. K. Narayan? I am, however, glad that Churumuri pokes fun at our pandith madyaadhipathi from Mangaluru. The first time I went to the Mysore air port was when I was in school, with my brother, doubles on Sathar’s bicycle to see Sardar Vallabai Patel! i don’t understand why they are spraying water. Why does Pulikeshi always have a problem when the names of certain Mysore greats are brought up? I thought his animosity was reserved for the Wadiyar family but now Mr. Narayan also apparently has done him some wrong! Good news, but what use? We’ve had Kingfisher stop flights to/from Belgaavi recently quoting poor business. How much time before it happens to Mysore also? A tourist will not love air-hopping twin-cities as much as traveling by rail/road between them as long as the land journey between them is either very long, dirty or hard to make. Neither will I (being a localite in Mysore & Bengaluru, occasionally) benefit from this because the travel time to BIA from most parts of Bengaluru is more than what an airavata takes between the cities. Now will Mr Yeddy & his Reddy brothers help make the aerial route a better choice? Or will they lobby to make the land route relatively tougher??! Mallya is the “King Of Karnataka” and he is real “Mannina Maga” not like HD and HDK..fake mannina makkalu and shame of Karnataka. Sathar’s bicycle – You mean Sathar’s cycle shop near ballal circle ? Those were the days.Helicopter ride for public from Mandakalli was one of the attractions during Dasara. ” Ayyo 5 nimishadalle KRS band bidthalla Anna” – I asked my father in helicopter. That was the last time I visited Mandakalli some 20 yrs ago. Now I am in Beekman Place (Manhattan) – Jayalakshmi Puram of New York. It’s great news that MYS is on the airmap now. However, I was really hoping I could take this flight tomorrow and connect to my onward flight to Singapore from Bengaluru. Apparently, there’s an inaugural offer of Rs. 2k, and the prospect of beating the traffic to and in BLR makes the offer very interesting for a business traveler. But I was clearly hoping for too much, since the flight would land at Bengaluru at 3:10 pm. What do I do in the airport for 8 hours? It was then that I understood the importance of the words used in Kingfisher’s ad: “Connecting Mysore to India“. Yeah, it’s not “Connecting Mysore to the World“. If Kingfisher really wanted to connect Maisuru to the world, they’d land in Bengaluru at 9 pm, since all international flights leave approx 11pm+. The way it is now, business travelers are discouraged from taking this flight. That probably is in the DNA of Maisuru anyway: it’s the classical pensioner’s paradise! I concur with Tigers Whiskers The Ultimate. Next, will Churumuri start a campaign for ‘Malgudi Airport’? Hi Pari D Vyas, same Sathar, Dr Nagabushan madalyar’s shop near Blue shop. Sathar later started a bangle shop and his son in law looked after the cycle shop. We are from ‘Ayodhya’ next to Ballal hotel. We used to have Aerobatics those days during Dasara in 1950’s. Now I was in Mysore some time back, the whole thing has changed. Old Mysore with avenue trees on Kantarajaurs road is gone. At 6am there used to be a carpet of flowers in both sides of the road. Now you see only vehicles parked, no trees. The water cannon salute is the traditional welcome/farewell for new aeroplanes, new flights, retiring aeroplanes (like the Concorde), retiring pilots etc. Not sure what the history is, but it probably has something to do with the size of the aircraft and not having anything else that can gracefully arc the top without posing a danger of falling on it. Besides, it is quite inexpensive! BTW, the airport in the air traffic controller’s (and pilot’s) jargon would be VOMY which is the ICAO identifier. All airports in India begin with a V (and a K in the USA, G in the UK and so on). The O is for south India (the west has A, north India has I etc.). The last two letters identify the city – MY for Mysuru, ML for Mangalore, BL for the new BIAL, BG for the old HAL airport, BB for Mumbai and so on. The travel agent’s name for the airport would be MYQ which is the IATA identifier. Thank you for the explanation of the water cannon salute. Very interesting. Honestly, railway double line between Bangalore and Mysore and high speed non stop every one hour train is better than flights.